Received my dry-root trees today. They were well packed and looked healthy. Will be planting them in the next few days (as soon as the snow and ice melts!) so they will get a nice spring start when nature says, "GO!" We used to peel the bark from sassafras trees when i was young. I got to do this the first time in 65 years today. My, what a memory today has brought me back to. Had great quality and speedy shipping but the description could use more info. Sassafras Tree is a fragrant addition to yards, businesses, and gardens. It grows quickly from 30 to 115 ft. tall, but its unique unlobed oval, trilobed, and bilobed leaves set it apart from other trees. The sassafras tree provides food and shelter for wildlife. Its summery yellow blooms are mildly fragrant, though all parts of the tree smell of citrus and root beer. Drought resistant, sassafras grows well in sandy soil, prefers full sun, and does well in zones 5 through 9. Sassafras Tree, otherwise known as Sassafras albidum, is a deciduous member of the tree family with native roots encompassing the range of Eastern North America. Considered a moderately pure plant to maintain, its hardiness has been proven as it is easy to grow in average well-drained soil. A suitable choice for gardeners with sizeable garden space. These are zones recommended for species of plants that demonstrate compatible growing environments as defined by the United States Department of Agriculture. Also a flowering tree, the Sassafras is formed of a canopy of wide, broad, true-green leaves with a medium-pigmentated deep hue and pale white veining apparent. Sassafras Tree surface area and outline of the leaves change shape as the leaves reach maturity, forming spade-like patterns and variations of such. The blooms are delicate and hypnotic to insects. Flower structure is of compound organization with six pale yellow translucent petals and subtle veining visible throughout; the center contains darker yellow pigment apparent within the nine stamens possessed by the male flower, and also the centered pistil of the female. The natural habitat is fields, open woods, and along fences- sassafras flourishes in environments similar to such. Prefers moist, well-drained soils or sandy loam soils, but is fairly tolerant of a wide variety of soil conditions. Depending upon the amount of rainfall, sassafras reportedly shed leaves in response to climate change. The leaves, bark, twigs, stems, and fruits are consumed and utilized by birds, mammals, and insects. 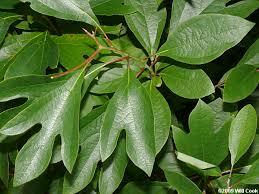 The sassafras compliments a naturalized garden atmosphere or habitat offering room to grow and space to thrive.